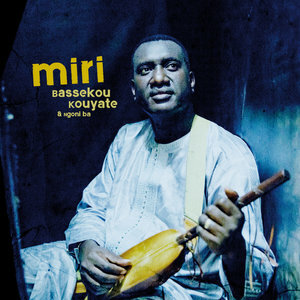 Bassekou Kouyate and band Ngoni Ba's unplugged new Malian folk music release Miri is anything but basic. From an international perspective, few players of the stringed ngoni are as renowned as Malian artist Bassekou Kouyaté, leader of the band Ngoni Ba. Much of his global clout comes from his reputation as an innovator, melding plugged-in rock with West African folk sounds to engage a broader base of listeners than your average ngoni virtuoso. 2015's Ba Power saw Kouyaté at perhaps the peak of this hybrid sound, an electrifying exploration of the ngoni's stylistic limits. He and Ngoni Ba return to Out Here Records for their fifth release, the label on which they released their first three albums. Accordingly, the album sees the band get to its roots. New album Miri largely returns to a more stripped-down folk sound, not eschewing innovation but certainly shifting the focus to the band's sheer acoustic technique - as well as that of other featured artists. West African superstars from outside the band abound; Habib Koité, Ali Farka Touré band veteran Afel Bocoum, and griot Abdoulaye Diabaté sing, while Moroccan musician Majid Bekkas sings and plays oud on "Kanougnon". The guests come from outside of the continent, too, including Snarky Puppy's Michael League, Carolina Chocolate Drops co-founder Dom Flemons, Madera Limpia bandleader Yasel González Rivera, and progressive bluegrass fiddler Casey Driessen. Though an impressive lineup, the guests truly are secondary. Ngoni Ba is as tight as ever on its own. Lead vocalist Amy Sacko continues to bring heart, soul, and strength to every track, supported but never eclipsed by the album's crew of backing and guest vocalists. Minimal percussion and nimble strings lay the perfect foundation for radiant flows of music. On tracks like rapturous opener "Kanougnon", this flow is a trickle of mellow warmth, but it can also be a red-hot geyser, as it is on "Wele Ni", a track that features Diabaté slinging some serious desert blues-style guitar lines. A wide range of moods makes Miri a beautifully unpredictable work of art, particularly in the second half of the album. Track "Konya" features an upward spiral of instrumental action in between legato vocal verses. Midtempo "Nyame" features low, rumbling vocals and thick polyphony. Sacko's lyrics arrive in arresting syncopation to the various string lines, which include Driessen's sturdy double stop work. Where recent Ngoni Ba albums have been explosive, Miri's subtleties make its standout moments even more surprising. When every instrument comes together in staccato unison on "Yakare", it is because of the shift from soft, organic staggering that the negative space makes such impact. When González joins the group for "Wele Cuba", the infusion of Afro-Cuban rhythms, such a natural fit for Ngoni Ba's specifically Malian sounds, stands out with ease, rather than by force. Bassekou Kouyate and his family, by blood and otherwise, are a masterful crew. Miri is not their most immediately attention-grabbing work. Instead, it is an ornate display of timeless beauty, intricate, colorful, and technical, evoking older West African traditions and a global network of sound along with pristine, modern-day production quality and a brilliant sense of composition and ingenuity.